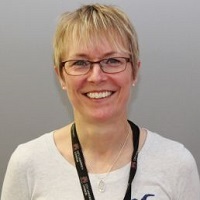 Karen is a Senior Lecturer in Adult Nursing specialising in teaching professional issues in nursing and clinical skills. She joined City University London in 1991 and prior to this worked in London and West Sussex. She has had a variety of roles since joining City University London including Programme Manager for the MSc Nursing and is currently the Educational Lead for the Adult Years Division. Karen initially worked as a nurse specialising in cardiac care for a number of years in London and Brighton. She was a Ward Sister at the Middlesex Hospital London prior to moving into nurse education. Karen has continued to maintain her cardiac interest through her role as Link Lecturer at the London Chest Hospital. Karen's main teaching interests are professional nursing issues, clinical decision making, medicines management and clinical skills. Karen has extensive experience of developing and managing programmes for both pre- and post-registration nurses. Her current research interest relates to the evaluation of technology enabled academic practice. Karen's current research interest lies in the evaluation of technology enabled academic practice. She is currently taking part in a team project that aims to evaluate the blended approach to learning and teaching adopted for the PG Diploma in Nursing. Nicol, M., Bavin, C., Cronin, P., Rawlings-Anderson, K., Cole, E. and Hunter, J. (2012). Essential Nursing Skills. Mosby Limited. ISBN 978-0-7234-3777-2. Nicol, M., Bavin, C., Cronin, C. and Rawlings-Anderson, K. (2008). Essential Nursing Skills. London: Mosby Elsevier. Rawlings-Anderson, K. and Sumner, N. (2015). MOVING FORWARD WITH A BLENDED LEARNING CURRICULUM: A CASE STUDY IN COLLABORATION. Rawlings-Anderson, K., Perovic, N. and Sumner, N. (2013). 'FINDING THE BLEND': AN EVALUATION OF THE BALANCE BETWEEN ONLINE AND FACE TO FACE LEARNING AND TEACHING IN A BLENDED CURRICULUM. Rawlings-Anderson, K., Perovic, N. and Sumner, N. (2014). Project report: Evaluation of two post-graduate pre-registration nursing modules ‘Finding the Blend’: An evaluation of the balance between online and face to face learning and teaching in a blended curriculum. Learning at City Journal, 4(1), pp. 41–52. Manning, A., Cronin, P., Monaghan, A. and Rawlings-Anderson, K. (2009). Supporting students in practice: An exploration of reflective groups as a means of support. Nurse Educ Pract, 9(3), pp. 176–183. doi:10.1016/j.nepr.2008.07.001 . Hunter, J. and Rawlings-Anderson, K. (2008). Respiratory assessment. Nurs Stand, 22(41), pp. 41–43. doi:10.7748/ns2008.06.22.41.41.c6576 . Rawlings-Anderson, K. and Hunter, J. (2008). Monitoring pulse rate. Nurs Stand, 22(31), pp. 41–43. Rawlings-Anderson, K. and Hunter, J. (2008). Monitoring pulse rate. Nursing Standard, 22(31), pp. 41–43. Noble, H., Kelly, D., Rawlings-Anderson, K. and Meyer, J. (2007). A concept analysis of renal supportive care: the changing world of nephrology. J Adv Nurs, 59(6), pp. 644–653. doi:10.1111/j.1365-2648.2007.04383.x . Noble, H., Kelly, D., Rawlings-Anderson, K. and Meyer, J. (2007). A concept analysis of renal supportive care: The changing world of nephrology. Journal of Advanced Nursing, 59(6), pp. 644–653. doi:10.1111/j.1365-2648.2007.04383.x . Rawlings-Anderson, K. (2004). Assessing the cultural and religious needs of older people. Nurs Older People, 16(8), pp. 29–33. doi:10.7748/nop2004.11.16.8.29.c2343 . Rawlings-Anderson, K. and Johnson, K. (2003). Myocardial infarction and older people. Nurs Older People, 15(6), pp. 29–34. doi:10.7748/nop2003.09.15.6.29.c2271 . Rawlings-Anderson, K. (2002). Heart failure and older people. Nurs Older People, 14(6), pp. 23–29. doi:10.7748/nop2002.09.14.6.23.c2221 . Rawlings-Anderson, K. (2001). Working with older people from minority ethnic groups. Nurs Older People, 13(5), pp. 21–26. doi:10.7748/nop2001.07.13.5.21.c2184 . Nicol, M., Bavin, C., Bedford-Turner, S., Cronin, P. and Rawlings-Anderson, K. (2000). 3. Nutrition and hydration: feeding adults. Nurs Stand, 14(46), p. 2. Nicol, M., Bavin, C., Bedford-Turner, S., Cronin, P. and Rawlings-Anderson, K. (2000). 1. Taking blood pressure. Nurs Stand, 14(38), p. 2. Platzer, H. and Rawlings-Anderson, K. (1991). Sexist language--why fuss? Nurs Stand, 5(22), pp. 54–56. Johnson, K and Rawlings-Anderson, K. (eds) (2007) Oxford Handbook of Cardiac Nursing, Oxford: Oxford University Press. 'Finding the Blend' : An evaluation of the balance between online and face to face learning and teaching in a blended curriculum. London (2013).